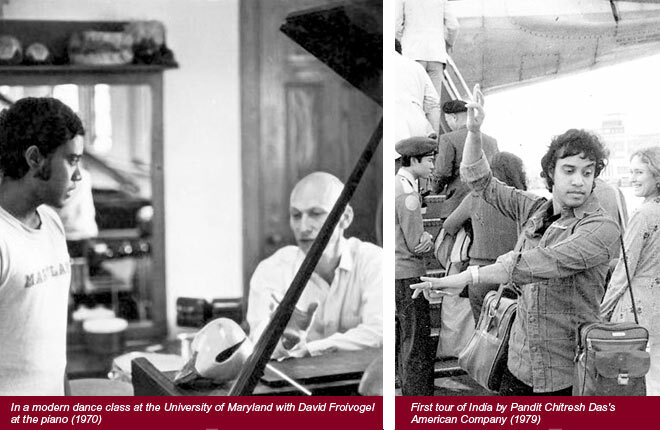 1970: Pandit Das receives a Whitney Fellowship through the University of Maryland to teach kathak. 1971: Pandit Das is invited by Ustad Ali Akbar Khan to establish a kathak dance program at the renowned Ali Akbar College of Music in California. 1972: Gretchen Hayden begins her study of kathak under Chitresh Das’ instruction. 1970s: Chitresh Das’ advanced dancers put on many performances, including Sita Haran and Govardhan Giri with music composed by Ustad Ali Akbar Khan and performed with the New Maihar Band, an ensemble he created. 1980: Performances culminate in the official founding of the Chitresh Das Dance Company and Chhandam School. Gretchen Hayden becomes a principal dancer in the Company.